Have a large amount of valuable stocks or equipment in your warehouse and need a warehouse security system to watch them? Read this to know how to choose the best security camera system for a warehouse, and some top warehouse security cameras for your choice. Warehouses in different square meters or of different sizes will definitely have different requirement for alarm or video surveillance systems. But there are always some common features they share. #2. Night vision. The warehouse security monitoring system with excellent night vision can serve as a night security guard, watching your properties and assets in the warehouse 24/7 unfailingly. Generally, the quantity and quality of IR LED lights decide the night vision distance together. #3. Mobile App. Security camera for warehouse with mobile App lets you monitor the warehouse from anywhere. To get the most out of your warehouse security camera, you can install the iPhone or Android app for your warehouse camera on your mobile device. #4. Wide angle. A large-sized warehouse requires a camera product with a wide angel, covering every corner. Fisheye security cameras and PTZ cameras are all good warehouse security cameras with a wide viewing angle and coverage. #5. Waterproof. To keep an eye on the outside area of your warehouse, warehouse security cameras should be water-resistant. Usually an IP 66 waterproof rating enables your camera to work normally even in extreme weather conditions. I’d like to shed some lights on the best warehouse security camera systems to help you choose the one that’s right for you. If your warehouse is just a small-sized one, I would recommend RLC-423 security monitoring camera for your warehouse. It is a PTZ (Pan/Tilt/Zoom) PoE security camera with a viewing angle of 36°~100°, used both in and out of your warehouse. It can rotate 360° endless horizontally and 90° vertically, capturing super HD (4MP) videos and monitoring every corner of your area and never miss a single thing. With free Reolink App installed on your iPhone or Android phone, it’s of great convenience for you to control your RLC-423 warehouse security camera. You know exactly what happens in your warehouse when you are not there. If there is a break-in, you’ll receive real-time alerts and take immediate measures to stop the theft before it happens. 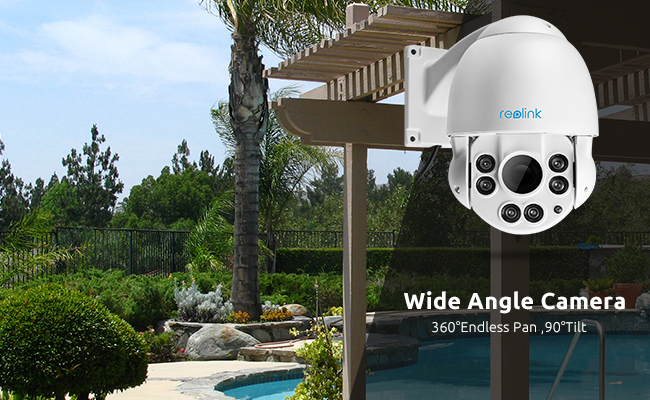 RLC-423 super HD warehouse security camera is available at a price of $249.99 on the Reolink official website. Refer to the video captured by RLC-423 PTZ security camera for warehouse, if you are still considering if it is right for your place. For a large warehouse which is hundreds of square meters or larger, the best security solution is to install all-in-one warehouse security camera systems, including several cameras and a NVR/DVR. No doubt, RLK8-410B4 PoE NVR security system is your top choice to secure your warehouse. 4 super HD cameras, installed at every weak entry, give you a sharp view of all suspicious activities in your warehouse. And up to 36pcs of infrared LEDs let your security system see clearly at night. 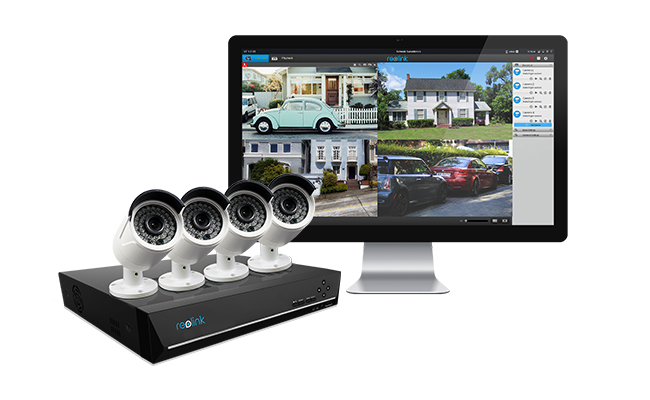 The PoE NVR records 24/7 continuously, allowing you to playback whatever happened. You can also monitor and control the system on your mobile App, the same as you do on RLC-423 warehouse security camera. This RLK-8-410B4 warehouse security system cost is $549.99 at the moment. Go to warehouse security system reviews to know what other users say about it. No single warehouse security measure will prevent theft completely. Besides alarm systems and video surveillance cameras, you can also take other safety and security measures in a warehouse and make warehouse security plans to protect your properties and belongs. #1. Check all entrance points, and prevent suspicious people from accessing your warehouse. #2. Install a proper type of door, which is made of hard materials, such as metal, and also harden your door frames. #3. Change to sturdy locks. Also make your warehouse is well lit with motion sensor lightning, which also saves money. A dark warehouse is more vulnerable and more likely to be burglars. #4. Separate loading docks from parking lots, and separate the shipping and receiving docks. #5. Hire employees with no felony records. Do background check before hiring someone. #6. For a pretty large distribution center and warehouse, strict inspection is required for all outbound trucks at the warehouse’s security check point. This entry was posted in Buyer's Guide and tagged business security cameras, warehouse security cameras.